Greater Noida police nabs gang of five thieves, recovers cell-phones worth over five lakh! 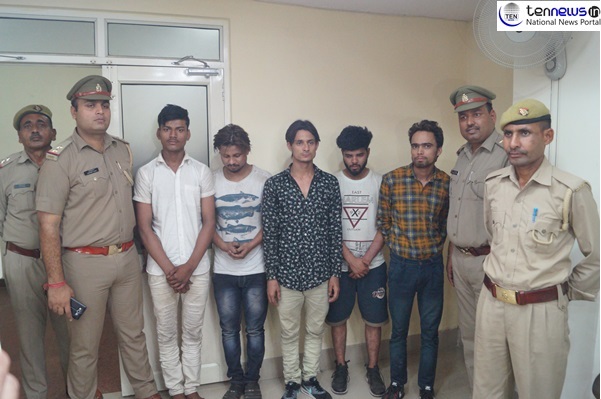 Greater Noida police today nabbed gang of five thieves from Dominoes roundabout when they were scouting in the area in a stolen vehicle with fake number plate. The gang was wanted in many cases pertaining to loot and theft. On 5th May they had robbed Universal Mobile Shop, Jagat Farm, Greater Noida after cutting its shutter. They had also performed robberies at a Confectionery store in Tugalpur and Bhangel areas of Greater Noida and Noida respectively. The gang was led by Rizwan and Wahid both residents of Bulandshaher district. They were also wanted in similar cases by Ashok Nagar police. While Wahid along with other four gang members namely Wasim, Irfan, Armaan and Aamir have been arrested Rijwan is still at large. Police is interrogating other members to know about his whereabouts and ensure his arrest at the earliest. Police has also recovered a country made pistol, two knives and 14 mobile phones from the gang along with ninety three thousand cash. The gang would target shops falling in darker and isolated areas and would perform robberies after breaking-in with the help of cutters and other instruments. None of the arrested convicts have completed their higher education and belong to families with normal backgrounds.